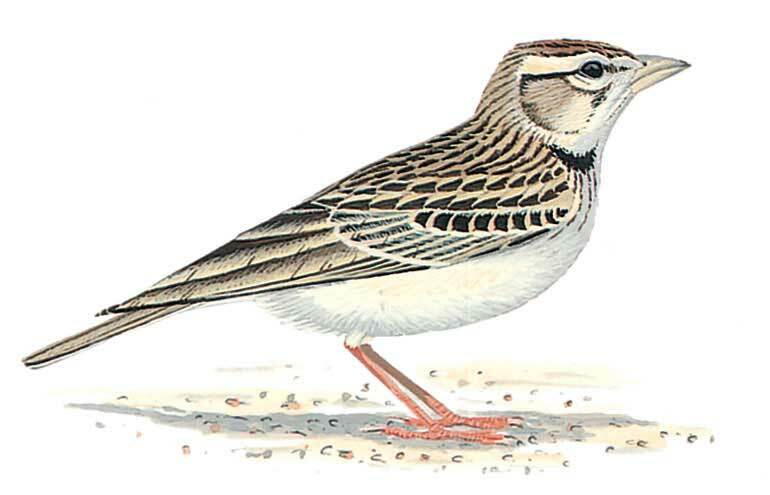 Small pale lark with well streaked upperparts, buffish white generally unstreaked underparts with variable black patch at sides of throat (adult); relatively stout pale bill, long tertials almost covering wing-tip (unless worn) and boldly patterned median coverts; also prominent buffish white supercilium, pale lores, dark eye-streak and small pale area on cheeks are further features. Variably streaked crown tinged rufous in some but greyish in most; upperparts pale or dark sandy grey-brown but tinged rufous in some. Told from Lesser Short-toed by black neck-patches (at best with thinly streaked sides of breast), long tertials and longer bill (Lesser Short-toed has more distinctly-streaked breast, shorter, more ‘bulbous’ bill, shorter tertials not covering wing-tip; head pattern generally less pronounced). Juvenile lacks neck-patches of adult (achieved early autumn), has few streaks or blotches on breast, much like similar Lesser Short-toed, but bill longer; when fully grown the tertials are also longer. Flight undulating; foraging and migrating flocks pack densely and fly low.